We love Fairy Tales in our home. There is just something wonderful and magical about them. My youngest daughter "Little Red" was so excited to come home and tell me that every Friday in her 1st grade class they have what they call "Fairy Tale Friday". A volunteer (Mom, Dad, Grandpa, etc.) comes into the classroom and reads the assigned Fairy Tale for that week and then they get to come up with some type of activity to go along with that particular Fairy Tale. During this time "Little Red's" teacher (who we just love) pulls kids aside and works with them one on one. I think that it is absolutely brilliant! It is a win - win for everyone! Of course I signed up right away to be one of the Fairy Tale Friday volunteers. I absolutely love volunteering in my daughter's classrooms. I miss them a lot during the day! The first Fairy Tale I was assigned was Little Red Riding Hood. 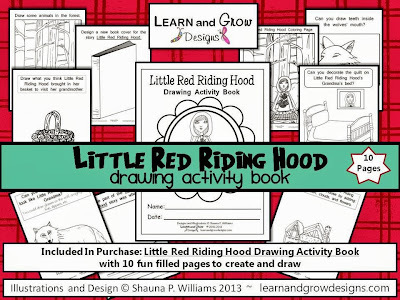 I thought for a while what the perfect activity would be and then one evening when I was lying in bed and my mind was going a million miles an hour (that happens a lot) the idea came to me to create a fun "Little Red Riding Hood Drawing Activity Book". 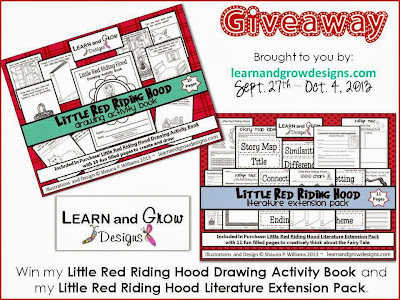 *Don't forget to check out my Little Red Riding Hood Giveaway at the end of this post. First I read the story Little Red Riding Hood by Trina Schart Hyman to the class. The story has such beautiful illustrations. You can see why it won the Caldecott Honors Award. After we read and talked about the story, I explained the different pages of the "Little Red Riding Hood Drawing Activity Book" to the students. I was pretty proud with how this book turned out. I actually drew all of the illustrations myself. I love when I can incorporate two of my loves, art and education together. You can see some of the student examples above. The students LOVED this book. Few...I was so excited to see their reactions. The boys and girls were equally excited about it. The picture above was drawn by my daughter "Little Red". This page where they had to disguise the wolf to look like Little Red Riding Hood's Grandma was a definite favorite. I thought "Little Red's" drawing was so darling, slippers included. Here are some more student examples above. Now of course my older daughter "Little Blonde" saw the drawing activity book and wanted to make sure that she was going to be able to have her own copy as well. The drawing above is "Little Blonde's" rendition of the wolf disguised as grandma. I love the glasses that have the chain attached. I also love how she drew the nightgown stretched over the wolf's body so that you see the fur on it's back poking out in between the buttons. So clever! Here is the quilt "Little Blonde" designed for Little Red Riding Hood's Grandma's bed. I love her beautiful rose she drew. 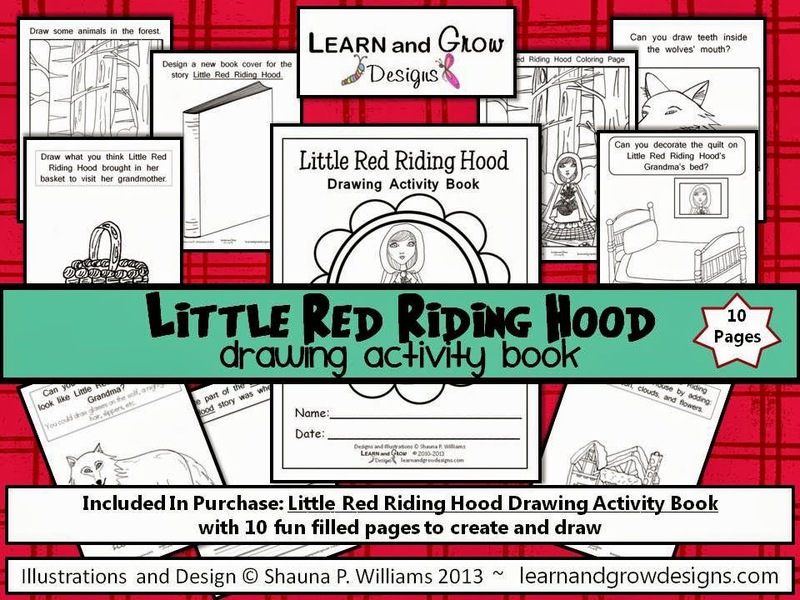 CLICK HERE to be taken to my Learn and Grow Designs Teacher's Notebook Shop. 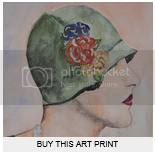 CLICK HERE to be taken to my Learn and Grow Designs Etsy Shop. 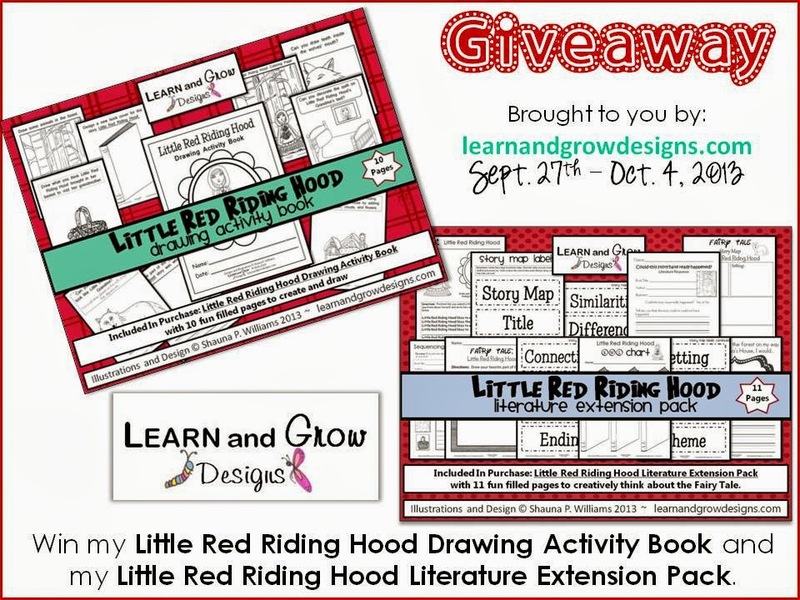 I had so much fun creating my "Little Red Riding Hood Drawing Activity Book" that I decided to create a "Little Red Riding Hood Literature Extension Pack". 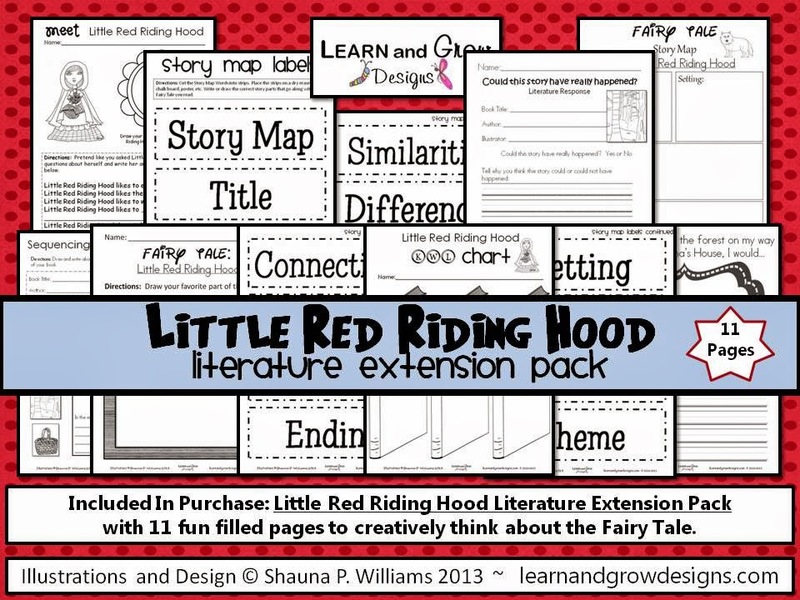 O.K., I don't know which Little Red Riding Hood Resource I love more. 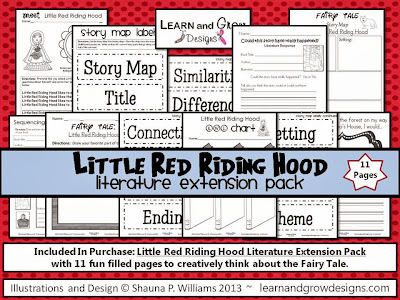 The literature extension pack has so many different creative and fun writing activities. Your children will love them. My daughters had so much fun filling the papers out. 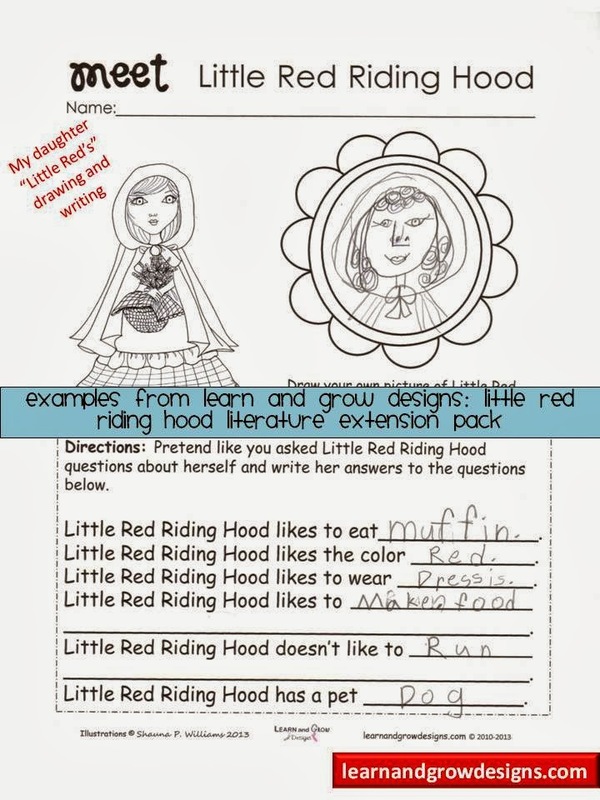 Here is my 1st Grade daughter's "Meet Little Red Riding Hood" page from my literature extension pack. 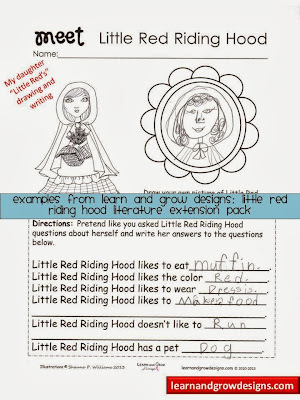 I LOVE her Little Red Riding Hood drawing and her answers made me smile. She wrote them all by herself! She said that Little Red Riding Hood likes to make food and that Little Red Riding Hood doesn't like to run. So cute! 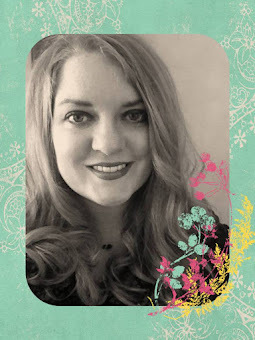 CLICK HERE to be taken to my giveaway that ends on Friday, Oct. 3rd. So fun to see actual samples of your fabulous packets. I'm so glad you shared.